Feed Your Spring Fever with a Day Trip to Martha’s Vineyard! This is the perfect time to visit the beautiful island of Martha’s Vineyard. Explore, shop and sample some of the best island cuisine at the Coop DeVille or the Martha’s Vineyard Chowder Company before all the summer crowds arrive! It’s easy to get around town or venture out to another of the island’s five towns: Edgartown, Tisbury (Vineyard Haven), West Tisbury, Chilmark and Aquinnah (formerly Gay Head). We can’t wait to see you! 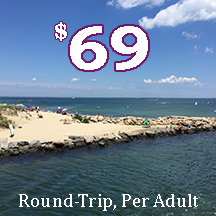 This Martha’s Vineyard Special includes round-trip ticket adult ticket aboard our high-speed ferry and a $25 gift certificate for lunch or dinner. RESERVATIONS can only be made by calling (800) 492-8082. Call now! Choose from these two Oak Bluffs, Martha’s Vineyard restaurants we love! Coop DeVille offers casual outdoor seating and well-prepared New England seafood. Bring the family for steamers, boiled lobster, fried clams, and 8 flavors of Buffalo chicken wings. Open for lunch and dinner daily 11:00 am to 8:00 pm. Located in the Dockside Marketplace, Oak Bluffs Harbor. 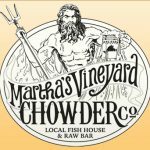 Voted Best Chowder in New England by Yankee Magazine and Best Chowder by Cape Cod Life, Martha’s Vineyard Magazine, and Patch.com reader’s poll. Voted Best New Restaurant by Boston Magazine. Open for lunch and dinner daily 11:30 am to 10:00 pm. Oak Bluffs Avenue, Oak Bluffs. Restaurant gift certificates must be used on day of sailing, gratuity not included, no cash value, not valid with other discounts or special offers such as group rates, commuter book tickets, hotel vouchers, daily deals, etc.